Discover the delights of Amsterdam on a private 4-hour walking tour of the city’s historical and cultural highlights. 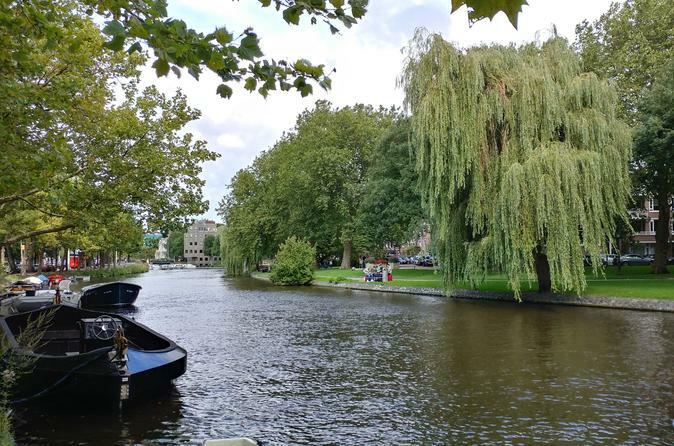 With a knowledgeable private guide, go to the Museum Square where the Van Gogh Museum is located; delve into the city’s renowned houseboat culture at the Houseboat Museum; and pleasure your palate with traditional Dutch snacks at Albert Cuyp, the largest street market in the Netherlands. Then, absorb the verdant beauty of Vondelpark and delve into the poignant history of Anne Frank’s House on this comprehensive tour. Parti dal tuo hotel di Amsterdam o dalla città centrale e raggiungi il punto di partenza del tour a piedi. Dopo aver salutato la tua guida esperta, sali su un tram destinato al distretto di Jordaan, ascoltando interessanti commenti riguardo alla radicale trasformazione del distretto durante il tuo viaggio. All'arrivo, passate davanti alla West Kirk e alla casa di Anna Frank per ascoltare la tragica storia dell'edificio, e poi ottenere uno spaccato affascinante sulla cultura della casa galleggiante della città al Museo Houseboat. Camminate verso la vivace zona di Leidseplein per deliziare il vostro palato con i tradizionali spuntini della "finestra" olandese; assaggia i morsi come kroket (crocchette di vitello fritte) e poi continua al Museum District per vedere il Van Gogh Museum. Cattura le fotografie del luminoso e bellissimo Vondelpark prima di concludere il tuo tour ad Albert Cuyp, il più grande mercato di strada dei Paesi Bassi. Passeggia tra le bancarelle ben fornite che vendono di tutto, dai vestiti vintage ai prodotti locali. Dopo aver esplorato per quattro ore, offri alla tua guida un affettuoso addio al mercato Albert Cuyp e continua a scoprire la capitale olandese al tuo ritmo. Diese private Führung mit unserem Guide Rob war genial. Er konnte alle Fragen problemlos beantworten. Ist sehr empfehlenswert. Robert was our amazing tour guide for a 4 hour walk on our first day in Amsterdam. Robert was energetic, knowledgeable, personable and was able to adapt our tour so that we ended at our house rental. His tour gave us a great perspective on how to navigate the city with ease for the rest of our trip. He showed us several sites that I don't think we would have found on our own for example, we walked through Central Station for a view of the water and ferry. There were four people in our group and he was able to address the interest of all of us - history, art, shopping. Overall, I would give him 6 stars if I could, but 5 will have to do. Highly recommend this as a first day activity to give you the overall idea of the City of Amsterdam. 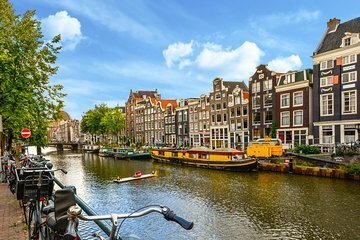 Amsterdã é uma cidade mágica!! Recomendo muito esta excursão o guia foi muito simpático, e demonstrou profundo conhecimento sobre a cidade. Absolutely wonderful. We learned so much about the city - past and present - and have a new appreciation for its place in history. Well worth it! Eveline was a wonderful tour guide. She was on time picking us up from our hotel, and then proceeded to show us around the beautiful city of Amsterdam. She had enough in her budget to shout us a cup of coffee, which was very welcome on the cold day. We want to thank Eveline for the tour, the highlight for us was the flower market. We recommend highly Eveline for a walking tour. This was a must do for any first timers to Amsterdam! Juliette was absolutely amazing with her knowledge of the city's history and a delight to tour with around the city. Wear your walking shoes! We truly covered the city and had a great overview of everything. The tour guide met us at our hotel promptly at 9:30 am. We had an amazing day with this guide. She was knowledgeable and courteous. Walked just over 18.5 km in 4 hours. Would recommend highly. A must tour when one in Amsterdam.Knowledgeable tour guide.Thumbs up for her. Parfait. Le guide nous a fait visiter Amsterdam et ses différents quartiers en nous racontant l'histoire et la vie de ses habitants.